Augusta, GA. 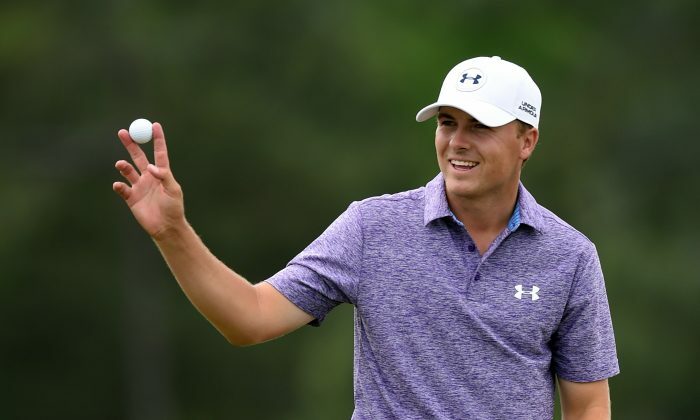 The easy storyline for the 79th Masters boils down to two words — Jordan Spieth — the leader by five shots after the first two rounds of the 79th Masters. Beyond his stellar play – thus far — is the overall story arc that’s been brewing since Rory McIlroy’s record setting romp in the ’11 US Open at Congressional. Younger players are more seasoned than their aging counterparts — and the maturity and wherewithal to compete quickly is now moving the age line to an earlier setting. The junior ranks where Tiger Woods held court roughly 20 years ago was only at its infancy in terms of the kind of rigorous preparation talented youngsters go through now. For a number of years the youth movement seemed only to be happening on the female side of the gender highway — now with the likes of McIlroy, Patrick Reed, Brooks Koepka and more importantly Spieth — it’s clear younger players are more prepared to compete at the highest of levels without the extended learning curve past players needed. It’s hard to imagine Spieth is a seasoned player at 21 — no misprint — 21 years old. Last year he tied for 2nd at Augusta and had a two-stroke lead at one point during the final round before making a few misplays that any young player likely would make. This time around Spieth is showing what he’s learned — making 15 birdies against just one bogey after the first two rounds is a clear and overpowering signal he’s clearly one year wiser. In late 2014 — Spieth showed a clear sign many missed. During the playing of the Australian Open Jordan fired a 63 on the final day and won by six shots. The conditions were anything but benign — he possessed the kind of extra gear that only the elite players at that level command. This year on the PGA Tour his play has been a steady and consistent force. Last week he lost in a playoff in the Houston Open but that finish is in his rear view mirror with a green jacket at stake this week. *Record low first-36-hole total of 130 — breaks the former mark set by Ray Floyd in 76 with 131. *Ties the lowest first 36-holes in a major shooting 130 — matched only by Nick Faldo in the ’92 Open Championship at Muirfield. *Ties the largest 36-hole lead at Augusta — five shots — matched only by the likes of Floyd in ’76, Jack Nicklaus in ’75 and Herman Keiser in ’46. *He’s the youngest first round leader in Masters history when he posted a 64. *Spieth becomes the 2nd youngest winner — just behind Woods when he first won a green jacket in ’97. *If he does win wire-to-wire he would be only the 5th do so — the last being Floyd in ’76. It also possible the four-round record for the Masters — 270 by Woods in ’97 and the greatest margin under par-4 in a major — also Woods with -19 aggregate set at the ’00 Open Championship — may fall too. Watching Spieth perform with such focus and precision — the foundations were set early on through rigorous competitions in the Texas junior golf ranks — he seems older than what his birth certificate indicates because his maturity makes him seem like someone who’s been doing this for 10 plus years. Younger performers today have their own “teams” with swing coaches, nutritionists, personal fitness trainers, to name just few contributors. But to Spieth’s considerable credit he knows 36-holes remain. He said several times the need for “patience” would be front and center for him as he gets ready for Saturday’s “moving day” where major swings have routinely happened. Spieth also mentioned how important it would be to stay in the moment — not getting distracted by shots and holes that were finished — or pushing too much emphasis in looking beyond the shot he’s immediately faced with. Spieth knows full well what happened to McIlroy back in ’11 at Augusta — having a four-shot lead going into he final day and then Rory collapsing with an 80. No question McIlroy learned a good deal as he came back just a few months later and totally obliterated the field when winning the ’11 US Open. The weekend at Augusta is always a golf extravaganza because so much can and often does happen. Will Spieth provide any crack that allows a ray of hope for those trailing him? That’s hard to say. The Texas-born golfer may well follow-up on what other legends from The Lone Star State have done at Augusta. Names such as Ben Hogan, Byron Nelson, Jimmy Demaret and Ben Crenshaw come quickly to mind. The storyline coming into Augusta this week was if Rory McIlroy was going to win his first green jacket and complete the career Grand Slam — with this 3rd consecutive major — that’s not going to happen. Tiger Woods emerged from his self-imposed break from the Tour and while his 142 total after two rounds is a good indicator that the former number player is ready to start playing better — he’s still far from being back among the very elite players. Ditto for three-time Masters champion Phil Mickelson. Without being harsh to either of these past giants — both are closer to hitting the ceremonial opening tee shot than to winning another Masters title. Jordan Spieth will be tested, as all aspiring champions are, in being able to marshal control over his physical and mental faculties. Green jackets at Augusta do not come easy — and they most certainly do not get fitted after 36-holes. But make no mistake about it — youth and passion are a hard combination to beat. Spieth is golf’s future and the wake-up call he is sending to all others who play golf professionally is a simple one — I plan on being around a awhile so get used to it. Others are lurking in the shadows ready to do likewise. Onward to the weekend. Everyone knows that Rory McIlroy is the favorite at the Masters, but who else is likely to wear the green jacket?